New York's Metropolitan Transportation Authority is among the largest single employer of Indians in the United States. What makes the 2,500 Indians tick in the MTA? It’s an alternate universe — a subterranean world as diverse and complicated and frenetic as New York City itself. Yes, located under some of the world’s most expensive real estate is a bustling netherworld that stokes the city’s economy. As you stroll on the crowded streets of Manhattan, Brooklyn, Queens or the Bronx, you may not realize it but there is a churning pressure cooker of activity sizzling right below your feet. We’re talking, of course, of New York’s byzantine subway system that completes 100 years of service this year. In recent years, thousands of Indian immigrants have poured their talent and their sweat into the subway system. Of MTA’s 65,000 workers, a whopping 2,500 are estimated to be of Indian origin, arguably the largest number in any single business enterprise on the East Coast. Some of them are completing over two decades of service. A hundred years ago, electric streetcars, omnibuses and steam-powered elevated trains were the only ways to get around New York until the subway, which is the centerpiece of the city’s mass transit system, opened on October 27, 1904. It was the fastest city transportation system in the world and its four-track design enabled both express and local trains to run in each direction, and made it possible to move large numbers of people efficiently. As new immigrants poured into the city, they were able to move to far-off areas like Queens and Brooklyn and for them, the subway became the mighty steel dragon on whose back they could ride to a better future, maintain a home in the outlying boroughs even as they worked in the city, and aspire to the American Dream. For new immigrants, the nickel a ride opened doors to new worlds and even today, for two bucks, a commuter can traverse the width and length of New York, a gargantuan inner city of 495 subway stations connecting 28 lines, moving through a maze of dark underground tunnels and elevated structures. Nagaraja, as president of Capital Construction Company, is overseeing this multi-billion dollar effort. For many Indian immigrants, the subway was one of their first tastes of Americana: Who doesn’t remember slipping that quaint shiny subway token into the slot for the first time and gaining access into a whole new world? It allowed a new immigrant to be transported from Times Square to the beaches of Coney Island, magical wonders all. The subway connection for immigrants goes much deeper: its very construction and maintenance is owed to immigrant labor, as newcomers toiled to bring it to fruition. Look at those 100 year old images and you see the hands that built it. As the subway celebrates its centennial, one has the eerie feeling that we are standing right in the midst of history, making history. For the story of the subway and the immigrants is closely intertwined. Indian Americans occupy every rung of the MTA ladder. From Mysore Nagaraja, is one of the five presidents of MTA, heading the Capital Construction Company, to several Indian American executives in key positions. Then there are over 300-400 engineers and hundreds others in every position from supervisor to computer programmer to conductor and token booth clerk. 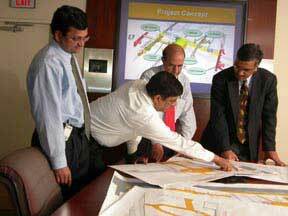 Indian American engineers especially were instrumental in revitalizing the deteriorating subway system and are now involved in an exciting venture to remake the face of mass transit. During the past decades, the MTA has lifted itself out of the unsavory chaos of the underground, the frequent breakdowns and derailments, the chain snatchings and the muggings on decrepit stations, and the graffiti infested cars, for which it was notorious in the 1970s and 1980s. In fact, according to the MTA, by the early 1980’s a third of the fleet was typically out of service during the morning rush hours, cars broke down or caught fire, trains derailed on hazardous track, and graffiti covered virtually every car. In 1982 the MTA began to rehabilitate the subways through a series of five-year Capital Programs, the largest public transportation rebuilding effort in national history, investing over $39 billion to transform the system. Today, MTA subways, buses, and railroads move 2.4 billion New Yorkers a year, about one in every three users of mass transit in the United States and two-thirds of the nation’s rail riders. When the MTA began aggressively recruiting new talent in the 1980s happened to be a time when many Indian Americans, savvy in engineering and computer technology, were looking for a job and happened to be at the right place at the right time. “It’s just such an amazing scene. 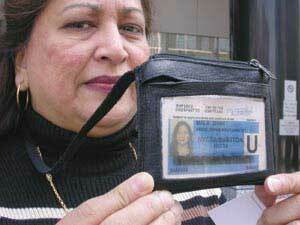 There are so many Indian Americans working below ground. The work itself is very complex,” says Nair. “I have been to subways and tunnels and signal departments and it’s a huge system really and beyond our comprehension and imagination.” He points out that there are 722 miles of tracks with over 7,000 subway cars in action. 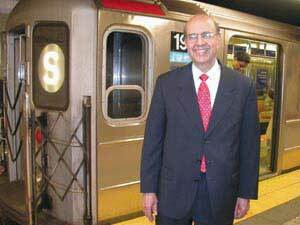 Nair estimates that over 2,000 Indian Americans work in the subway system, which he attributes to the opportunities for growth and promotion in the system. “It’s an organization where you can work with confidence that longevity is there and there is nothing you cannot do for yourself in the MTA. Jay Shah is so happy with the MTA that his brother and wife have also joined the authority. He says many of the Indians are in car equipment and maintenance, but at the same time many engineers and others work in rapid transit operations, such as conductors, motormen and yard dispatchers. Why are so many from Kerala? Well, Nair has a theory that since tests are an important part of the application and promotion process and as Kerala is the most literate state in India, Keralites seem to do very well in the MTA. Another contributing factor is that many immigrants from Kerala accompanied their wives, who were in the nursing profession and who came into the United States in the 70’s when there was a big demand for medical personnel. Of course.Chris Narayanaswamy, who hails from Palghat in Kerala, is manager, Compensations and Human Resources Departmental Operations. He has a pulse on who’s coming and going and his office maintains the records of all employees, from their appointment to their retirement or termination. 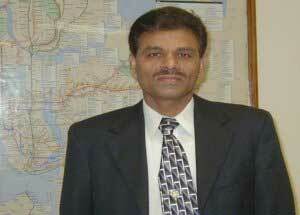 A senior industrial engineer in Mumbai, he decided to emigrate because his eldest brother was in the United States. 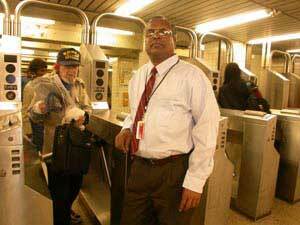 He started with the MTA in 1984 and will be completing 20 years this year. He points out that most workers tend to stay with the MTA because it’s a good employer, with job security, pension and medical benefits. Merit seems to be rewarded. The high literacy rates and English language skills aids Indian workers on their test-taking abilities, for the MTA has open, competitive tests for all positions like motorman, conductor or station agent. Says Narayanaswamy: “The benefits are a major attraction, as well as the overtime and health insurance, and the prospects of moving up are also great. For example, a station agent who is working in a token booth could move up to station supervisor and even station superintendent, by participating in exams at different levels. Associate Transit Management Analyst Mala Shah. So it’s a very merit based organization. I would say more Indians join in than leave.”Some Indian immigrants are also perhaps more willing to go the extra mile and do the tough job: Jay Shah, who had studied mechanical engineering, came from Bombay to do his masters at the State University of New York in the 80’s. Looking for a job, he worked at an appliance store, but when a position opened up at the MTA for a road car inspector, which is a maintenance job, he grabbed it. His job was to maintain the train on the road and move passengers and the train safely in the event of a breakdown. 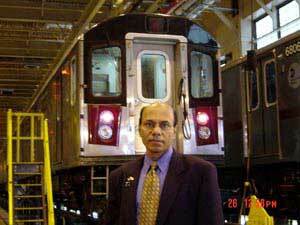 Although Shah had commuted by subway as a student, he got to see a whole different side of the underground as a mechanic, walking under the tunnels in the dark, learning to move the equipment, making repairs and even dealing with passengers during emergencies. In his 21 years underground, Shah has seen the face of the trains evolve as there’s been a big change in the type of cars, the maintenance practices and cleaning operation: “We also implemented a mid-life program for the cars, which helps to catch problems and doesn’t inconvenience the passengers.” Now through several promotions, Shah is the general superintendent for East New York maintenance shop, supervising over 850 subway cars, which run on five lines. He is so happy at the MTA that his brother as well as his wife Mala Shah have joined the MTA. Mala is as an associate transit management analyst, who estimates that several hundred Indian American women work in the MTA, with at least 30 -40 in her building alone. As president of MTA Capital Construction Company, Nagaraja leads the MTA’s multi-billion dollar capital system expansion projects, including the $6.4 billion East Side Access, a new Second Avenue Subway and the $2 billion extension of the No. 7 train to the West Side. He also handles the MTA Security Program, which is a $600 million security improvement program and spearheads two significant components of Lower Manhattan’s redevelopment, the $400 million Fulton Transit Center and the new South Ferry subway station complex. The total bill is close to $20 billion dollars and the projects will go on for the next 10 to 12 years. The long-awaited 2nd Avenue subway has been in planning for 60 years, and recently preliminary engineering commenced, as well as the environmental impact process that is the first stage of design. The project is finally becoming a reality for New Yorkers. Nagaraja, who is the youngest of 11 children, came from Bangalore to study at Brigham Young University and later worked with MW Kellogg before joining the MTA. As he plays a starring role in transforming the face of the New York subway with many radical changes, surely he must be a great inspiration to other Indian Americans working with the MTA? Each of these MTA hands gets a special kick from moving millions of people on their way, each serving as an important cog in what makes the subways work. Says Nair: “Every day is a new day and by the time I came in there will be work on my desk, there will be new things and new problems. And when you solve some problem and send out a train for service, it’s a big accomplishment when we make full service and the trains are out working. It’s a good feeling.” It is a feeling shared by Thambi Thalappillil, a deputy superintendent with car maintenance, who is completing 24 years with MTA. He came the United States from Kerala to join his wife, who is a nurse. He had worked with the Indian Air Force in maintenance and after studying at the Academy of Aeronautics at La Guardia, he heard about a job opening in the MTA. When he came in 1980, there were only three or four Indians in car equipment; now there are at least 200. Indians are serving in signals, train operators, dispatchers and token agents. While Indian Americans may be involved with the backstage construction and rejuvenation of the subways, the face commuters often get to see is of someone like Raju George, who works as a station agent or token booth clerk, selling metro cards and giving directions to passengers. Seven million people pass every day through the subway system with its moving population of commuters, the occasional homeless persons and the subway musicians and panhandlers. George, who’s been working as a token booth clerk since 1988 has seen it all, people from all over the world with different natures and cultures, and finds the mix fascinating. He remembers the old days when there were no metro cards and the thousands of tokens he had to carry in buckets after they emptied the machines in high volume stations like 42nd Street or 57th Street. In the 1980’s there was much more crime, and instances when tokens would get stuck or the occasional fare-beater. Sometimes he would encounter angry customers who would yell to him to go back to India or call him Gandhi. Through it all, he kept a positive and calm attitude. He says, “I don’t feel bad about it or take it personally. While the interaction with commuters is the main part of his work, it has gotten easier with vending machines and the computerization of ticket sales. George’s typical day is eight hours in the booth, with a half hour for lunch. According to the transit rules, agents are not supposed to leave the booth at all, nap or read or chat on the phone. If they need to go to the bathroom, a call to the field officer or command center gets them a replacement. As the subway system completes 100 years, exciting new configurations are being planned to take it into the new century. Uday Durg, who is program manager for the Lower Manhattan project, is overseeing the Fulton Street transit Center and the South Ferry tunnel rehab, a $750 million project that connects the World Trade Center to South Street Seaport. He’s the program manager responsible for the design and construction of all these mega projects and has construction and design managers working for him as part of the team. The construction is being phased in different segments and will be completed by December 2007, a major transit hub which will serve 250,000 customers a day. Durg came from Karnataka in 1985 and joined MTA in 1986 as assistant engineer and has steadily moved up the ladder, doing challenging projects like the $140 million project in Harlem and the Jamaica Swingbridge in the Far Rockaways. 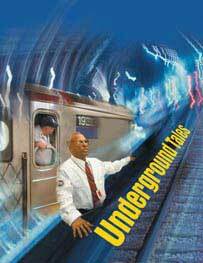 What he finds exhilarating is the engineering challenge: “It’s like an entire underground city by itself. The most satisfying thing is trying to understand how things work underground; the kind of safety features you need to implement and how to under connect existing buildings. In a world that encompasses 500 miles of track and 498 stations, the unexpected is always the expected, and Nagaraja and his team at Capital Construction are ensuring that multimillion-dollar mega projects get done on time and within budget.